Home / Astronomy / Effects / Latest Technology News / Physics / Black Hole Jets Detected --"Emit More Energy in One Second Than Our Sun Will Produce in Its Entire Lifetime"
Black Hole Jets Detected --"Emit More Energy in One Second Than Our Sun Will Produce in Its Entire Lifetime"
"The discovery of these supermassive black holes, which launch jets that emit more energy in one second than our sun will produce in its entire lifetime, was the culmination of a yearlong research project," said astrophysicist Marco Ajello, who has spent much of his career studying the evolution of distant galaxies. "Our next step is to increase our understanding of the mechanisms involved in the formation, development and activities of these amazing objects, which are the most powerful accelerators in the universe. We can't even come close to replicating such massive outputs of energy in our laboratories. The complexities we're attempting to unravel seem almost as mysterious as the black holes themselves." When the universe was young, a supermassive black hole -- bloated to the bursting point with stupendous power -- heaved out a jet of particle-infused energy that raced through the vastness of space at nearly the speed of light. Billions of years later scientists identified this black hole and four others similar to it that range in age from 1.4 billion to 1.9 billion years old. These objects emit copious gamma rays, light of the highest energy, that are billions of times more energetic than light that is visible to the human eye. The previously known earliest gamma-ray blazars -- a type of galaxy whose intense emission is powered by extremely powerful relativistic jets launched by monstrous black holes -- were more than 2 billion years old. Currently, the universe is estimated to be approximately 14 billion years old. The Clemson team's breakthroughs were made possible by recently juiced-up software on NASA's Fermi Gamma-ray Telescope. The refurbished software significantly boosted the orbiting telescope's sensitivity to a level that made these latest discoveries possible. "People are calling it the cheapest refurbishment in history," Ajello said. "Normally, for the Hubble Space Telescope, NASA had to send someone up to space to physically make these kinds of improvements. But in this case, they were able to do it remotely from an Earth-bound location. And of equal importance, the improvements were retroactive, which meant that the previous six years of data were also entirely reprocessed. This helped provide us with the information we needed to complete the first step of our research and also to strive onward in the learning process." Using Fermi data, Ajello and Paliya began with a catalog of 1.4 million quasars, which are galaxies that harbor at their centers active supermassive black holes. Over the course of a year, they narrowed their search to 1,100 objects. Of these, five were finally determined to be newly discovered gamma-ray blazars that were the farthest away - and youngest - ever identified. "After using our filters and other devices, we were left with about 1,100 sources. And then we did the diagnostics for all of these and were able to narrow them down to 25 to 30 sources," Paliya said. "But we still had to confirm that what we had detected was scientifically authentic. 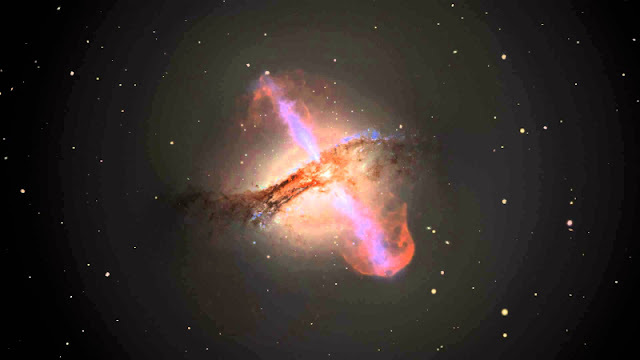 So we performed a number of other simulations and were able to derive properties such as black hole mass and jet power. Ultimately, we confirmed that these five sources were guaranteed to be gamma-ray blazars, with the farthest one being about 1.4 billion years old from the beginning of time." Marcotulli, who joined Ajello's group as a Ph.D student in 2016, has been studying the blazars' mechanisms by using images and data delivered from another orbiting NASA telescope, the Nuclear Spectroscopic Telescope Array (NuSTAR). At first, Marcotulli's role was to understand the emission mechanism of gamma-ray blazars closer to us. Now she is turning her attention toward the most distant objects in a quest to understand what makes them so powerful. "We're trying to understand the full spectrum of the energy distribution of these objects by using physical models," Marcotulli said. "We are currently able to model what's happening far more accurately than previously devised, and eventually we'll be able to better understand what processes are occurring in the jets and which particles are radiating all the energy that we see. Are they electrons? Or protons? How are they interacting with surrounding photons? All these parameters are not fully understood right now. But every day we are deepening our understanding." All galaxies have black holes at their centers - some actively feeding on the matter surrounding them, others lying relatively dormant. Our own galaxy has at its center a super-sized black hole that is currently dormant. Ajello said that only one of every 10 black holes in today's universe are active. But when the universe was much younger, it was closer to a 50-50 ratio. The supermassive black holes at the center of the five newly discovered blazar galaxies are among the largest types of black holes ever observed, on the order of hundreds of thousands to billions of times the mass of our own sun. This has stunned astronomers and got everyone’s attention. And their accompanying accretion disks - rotating swirls of matter that orbit the black holes - emit more than two trillion times the energy output of our sun. One of the most surprising elements of Ajello's research is how quickly - by cosmic measures - these supersized black holes must have grown in only 1.4 billion years. In terms of our current knowledge of how black holes grow, 1.4 billion years is barely enough time for a black hole to reach the mass of the ones discovered by Ajello's team. "How did these incomprehensibly enormous and energy-laden black holes form so quickly?" Ajello said. "Is it because one black hole ate a lot all the time for a very long time? Or maybe because it bumped into other black holes and merged into one? To be honest, we have no observations supporting either argument. There are mechanisms at work that we have yet to unravel. Puzzles that we have yet to solve. When we do eventually solve them, we will learn amazing things about how the universe was born, how it grew into what it has become, and what the distant future might hold as the universe continues to progress toward old age."